I normally don’t go back to a country so soon after visiting. In fact, for the past three years that I’ve been traveling frequently, I haven’t been to the same country twice. That changed when I went back to Australia. When I went there last year (middle of March), the weather mostly sucked. It was raining most of the time so I wasn’t able to do much exploring. Also, I was caught off guard by how expensive everything was and I realized I wasn’t prepared for it. The end result was I had to cut my trip short and fly to New Zealand much earlier than I planned. So yeah, I didn’t get to see much of the country. And I didn’t really get to enjoy the places I visited because of the weather (well except for Uluru). I didn’t get to enjoy spending time on those famed beaches on the east coast. So when I saw that rare cheap flight during the summer season, I immediately grabbed the opportunity. I was thinking maybe, setting foot in the country during the peak summer season justifies an early return. And I was right. My first stop was Sydney again, and it was so different. The last time I was there the city was kinda bleak because of the gloomy weather. But when I went back the city was bursting with life. Those famous beaches were full of people at any time of the day, any day of the week. It’s like being in an entirely different city. Sure it got scorching hot at times, but you wouldn’t really mind because the beaches are easily accessible! Just compare the pictures I took last year from the ones I took a few weeks back. The difference is palpable even if you just look at the pictures! I also found the nightlife way better the second time around… but it’s mostly because I already knew where to go lol. So most bars and clubs stop serving alcohol at 2 AM, and most of them close at around 3 AM. The trick is to find hotel bars that are still open. To know which ones to go to, it’s best to make friends with locals you meet at the clubs. They would know where to transfer when the bars stop serving alcohol! I’ve already discussed the attractions in Sydney in my post last year, so there’s no use mentioning all that again even though the experience seeing them during the summer was remarkably better thanks to the great weather. One place i didn’t go to last year was the Blue Mountains. I planned on going there before but every time i checked the weather forecast it was foggy in the area, there was even zero visibility at times. I didn’t see the point of going there if I won’t be able to see the incredible view. Since it was warm and sunny during my last visit, I made a point to finally visit the place. From Sydney, it’s easy to reach the Blue Mountains by train. Just head to the central train station and look for the Blue Mountains Line. Most people get off at Katoomba. It takes about 2 hours to get there, and a one way fare costs 12.20 AUD. 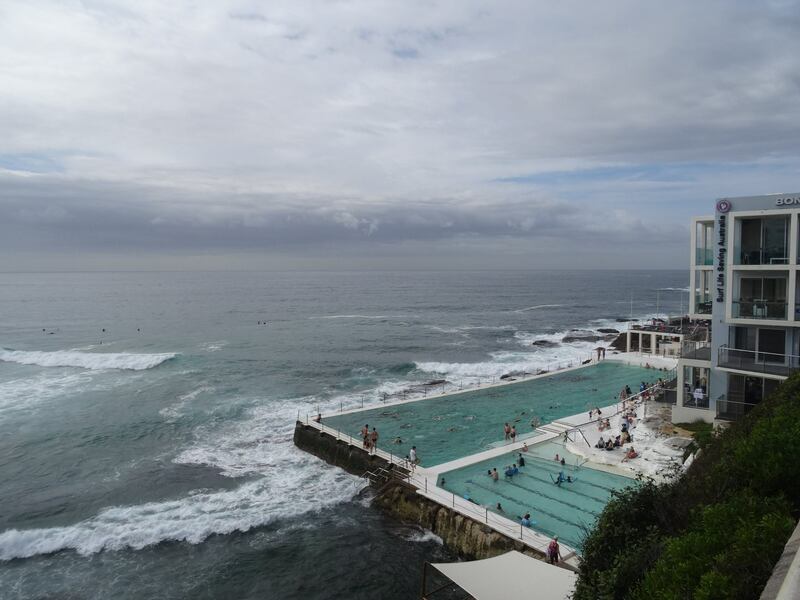 Since the place is easily accessible from Sydney, most people just do a day trip. You’re gonna see busloads of tourists doing day trips from Sydney. The entire area is massive, it’s a shame to just do day trips if you’re not on a tight schedule. Once you arrive at the train station, it’s easy to check out the attractions from there. Perhaps the most popular attraction is the Three Sisters, and the best view is from Echo Point. Just walk to the bus stop by Carrington Hotel and wait for bus 686. Bus fare is similar to those in Sydney, just use your Opal Card. Bus 686 also takes you to Scenic World— a place i wouldn’t really recommend. If you’re just doing a day trip, I guess it’s worth it. For only about 43 AUD (cheaper if you buy tickets early online), you get an unlimited day pass. That means you can ride both the cable car and the railway on the way down and back up. To be honest, it’s a pretty good deal, and I’d highly recommend it if not for the crowds. Practically all the tourists doing day trips converge here. Remember those bus loads of tourists you see in town? They all go to Scenic World. The queues to the cable car and railway are really long, you’re gonna spend more than an hour in line before you get to ride either one. And don’t think you’d get a respite from the crowds once you reach the forest. The areas in close proximity to the cable car and railway are crowded as well. I went on a weekend though, so maybe that’s a factor… not by much I’m guessing. On weekdays you won’t see many locals doing day trips, but tourists are present everyday. Maybe it’s better to visit during the off season if you just wanna do some hikes. You may not be able to witness spectacular views though because of the fog. As I’ve mentioned above, the entire area is massive. From Echo Point, you’d get an idea of how enormous it is and you’ll immediately feel a tinge of regret if you just decide to do a day trip. I guess 3 days would be enough to do a couple of hikes. Stay longer if you wanna do more. Just don’t be too adventurous when you go hiking on your own. Stay on the marked paths, a lot of people get lost every year and it’s understandable why rescue operations are difficult considering how dense and vast the forest is. There has also been a number of deaths due to rock slides, so it’s best to stick to the most common hiking paths. As long as the weather is good, I highly recommend a visit to the Blue Mountains. Australia is blessed with so many natural wonders. Because of its proximity to Sydney, it’s a good introduction to the country’s natural beauty.